Leviathan Wakes is the first book in the New York Times bestselling series 'The Expanse'. This sci-fi novel is set in space, and details the acrimonious relations between Earth, Mars, and the Belters (humans who have been born and brought up on the asteroid belts). This rich backdrop provides an excellent setting for a story that is both complex and intriguing. Detective Miller is a cop on an asteroid base called Ceres. His personal life has taken a downturn and his career is following close behind. He has to deal with cases that other people don't want, and he later discovers just how little his employers appreciate his talents. As his life unravels, he becomes obsessed by one particular case, and this eventually leads him in a new and dangerous direction. Meanwhile, an Earther called Jim Holden and his crew find themselves trying to rescue a ship that has sent out a distress signal. When they try to help, they find that the situation is far from normal with the stricken vessel. The paths of Miller and Holden eventually collide and they form the backbone of Leviathan Wakes, but they are accompanied by a motley selection of interesting characters on their chosen path. The story is quite deep, and the characters are all well-formed, moody and above all, believable. This gripping story is more than you might expect from a typical space opera. I enjoyed Leviathan Wakes a great deal. It was a good story, with deep characters, and it was set in a detailed and interesting universe. As the first in the series, this book is a promising start, and I look forward to reading the sequels to find out what happens next. You may be wondering why James S.A. Corey has two heads in the picture above. 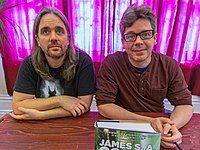 This is because James S.A. Corey is actually the pen name used by a couple of collaborators (Daniel Abraham and Ty Franck). 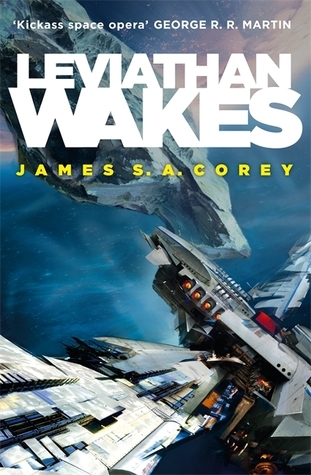 The two authors worked together to write Leviathan Wakes and the subsequent volumes of the series. They have also worked together on various Star Wars novels. Some readers may also be interested to know that the Expanse series is also being turned into a television series which starts broadcasting on the Syfy network in March 2015. I gave Leviathan Wakes 5 out of 5 stars. I would recommend this book to science fiction fans who like space operas with good characters and a complex plot.